Sustainable economy to preserve culture and stop exploitation. Be fair. Buy fair trade. From far-away villages in Guatemala, Mexico and Peru to your shopping cart. 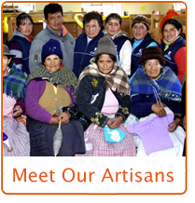 Artisans are justly compensated through fair business practices, transparency and social resposability. Incazteca assists them to produce and offer their cultural tradition and craftsmanship to the world through sustainable and environmentally conscious practices. Alpaca knitters, gourd makers, the artists that painstaikingly paint the pottery and musical instruments or the circles of women that knit the thousands of finger puppets and friendship bracelets are offered an opportunity to improve their standard of living. Preserving their culture and proudly producing in their artisan tradition and legacy quality and unique artisan products under Fair Trade Federation and Green America standards. Incazteca produces fine sarapes, alpaca blankets, baja hoodies, recycled plastic totes, sugar skulls, rugs and weavings in Mexico. Hacky sacks and fine beaded jewelry, unique hand bags in Guatemala. Tooled leather, fine artisan jewelry, purses and accesories, alpaca wear accessories and one of the finest alpaca fur rugs in Peru.